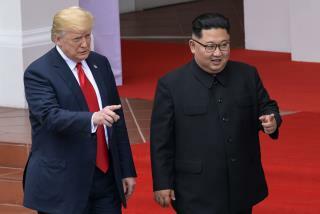 (Newser) – President Trump and Kim Jong Un signed a document after a historic day of meetings in Singapore on Tuesday and while the contents weren't immediately disclosed, it was clear that the two men had clicked. "We had a terrific day and we learned a lot about each other and our countries," Trump said, per the Guardian, describing the North Korean leader as a "very talented man" who "loves his country very much." Trump said he and "Chairman Kim" had both been "very honored" to sign a "very important" and "pretty comprehensive" agreement, the BBC reports. Trump shook the North Korean leader's hand and predicted: "We'll meet many times." Kim said that they had "decided to leave the past behind" and thanked Trump for "making this meeting happen." Kim may just be buying time, but I was shocked at how Trump complimented him knowing Kim's a psychopath. Trump sounded diplomatic, something I never expected to say with a straight face. HOLY F NONAME.... I do not think anyone will get the code style you input.... Not even Cool could cipher that, but I did catch your referacne. PS: RA is just one of many "For we are many". EU & NATO : At least the Trump-Kim 1st blind-date Summit was so-so, not turning out the South Korean President Moon Jae-in is not a traitor to sell the Korean peninsula to the foreign SOFA power to raise tension between Russia and NATO. Either North Korea is still suffering the 8 years and longer black man Barack Obama-Hillary Clinton's Sanctions, but now the EU nations can go ahead to resume to normalize Diplomacy and Normal Trade Relations (NTR) with DPRK and Euro-Korean currency exchange-rate.